Why did I leave the U.S. for graduate school? To answer this question with regards to how it applies to me, I must admit something from the get-go as this is my first blog for jobs.ac.uk: I am a total homebody. As my mother often told me while growing up, I would be the one of her four kids to stay close to home. And I, for a time, intended to fulfill that prophesy. I stayed in state for University. Why move far away when you could drive home on weekends to do homework and laundry? No one truly enjoys collecting quarters to use laundromats. Years go by. I study. A lot. I was now in my final year as a Microbiology major at Oregon State University, having packed pageantry, symphony orchestra, sorority life, and degrees in Spanish, Microbiology and Chemistry in my nearly five years there. For my undergrad honors thesis I was studying a variant of the Variola virus (that’s the causative agent of Smallpox, for non-virologists) in a local biotech lab. However, virology and I just were not clicking. I think the aversion to that particular project began with the Smallpox vaccination (not something the average person gets given these days). I was so ill afterwards I missed several mid-term exams. I thought research experience was supposed to add to my academic career – not undermine my progress! So, needless to say, I was on the prowl for a different sort of honours thesis project. And then, scrolling through a University listserv email – I found my ticket out of the U.S. It was to…Bermuda. 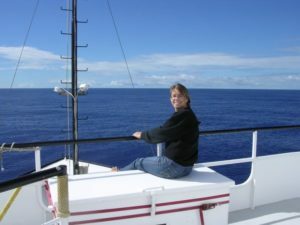 Science in a beautiful setting – the Sargasso Sea. I applied to the fully-funded internship not knowing where Bermuda was located. It didn’t matter. I just remembered the Disney Sword in the Stone reference to the island, and knew cool shorts would factor in. The research project, to be carried out at the Bermuda Institute of Ocean Sciences (BIOS), sounded really fantastic. It was funded by an NSF undergraduate research in ocean sciences. The project would allow me to study marine microbes as part of the Oceanic Microbial Observatory. Here’s a short interview I did with Science Magazine about that experience. We eventually published a paper which included some of the data from mine and others’ internships. Why did I leave the U.S. for grad school, and go to the U.K.? The answer in part is, for me it was time to see more of the world, and three months huddled behind a black shower curtain doing fluorescent microscopy in Bermuda showed me that working in research full-time (with samples that were not likely to kill me) was indeed fulfilling and exciting. Given that there are many ties to the U.K. in Bermuda, I learned from talking to people how higher education in the U.K. works. Prior to working at BIOS, I was preparing for the MCAT and the GRE for the U.S. medical and graduate school systems. I was so intimidated by what sounded like a period of life that was inherently debt-ridden, stressful and miserable. Just the entry fee for the graduate school experience was time, studying for expensive exams. Once accepted, initial years of graduate school didn’t seem focused on research but convoluted with student debt, exams, and teaching. In contrast, the U.K. system was a breath of fresh air. Average completion of a PhD is only 3-4 years – and completion rates are very high. I left with no debt (in fact, my savings from the PhD stipend helped me begin to pay off my bachelors’ degree debt and allowed me to travel around the world). I took no grad classes with exams, and teaching was paid, and only minimal. During my studies in the U.K. I traveled, worked hard, and played in four orchestras. 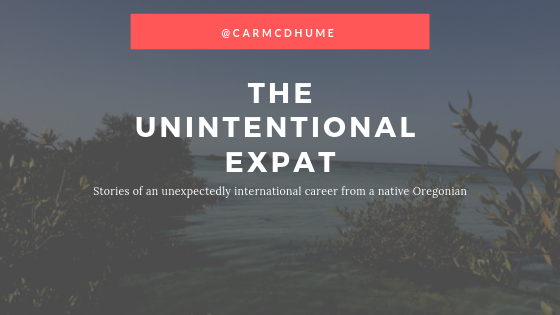 I made a great international set of new friends for life, and spoke/taught/mentored in STEM all-over the U.K. My experience helped me not only to see the world, not as a tourist but as an expat, but expanded my future career opportunities. How did I actually land this mythical graduate school experience? Not to leave you hanging, but that’s the topic of next months’ blog post. And follow me at @carmcdhume to get a daily dose of #scicomm fun. Post-script: Full disclosure. I also happened to meet my future husband during my internship in Bermuda. He was indeed a major reason for my seriously exploring grad school in the U.K. for the simple reason – he’s an Englishman. He’s a super cool scientist studying corals. Funny how things work out.